3 underappreciated trails to check out on National Trails Day! Meander along the 3 miles of trails between Spring Lake and Lake Desire. Visitors can climb the 900-foot-tall Echo Mountain for great views of the two lakes and the Cascade foothills! Backcountry trail use is the primary recreational activity and includes hiking, horseback riding and mountain biking. A recent trip report boasts of Bleeding Heart and Trillium lining the trails and delicate lilies blooming atop Echo Mountain. Pinnacle Peak Park is a 314-acre park, surrounding a volcanic cone that rises straight out of the Enumclaw farmlands and towers over the White River. A one-mile-long forested trail climbs 1,000 vertical feet to the top of the 1,800-foot geological knob. Once you get to the top, you will see extruded outcroppings of columnar basalt, concrete footings of an old fire lookout and best of all, spectacular views of Mount Rainier and the White River valley. Recent trip reports boast of yummy salmon berries! This is a great day hike for the family- short and sweet at only 2.4 miles roundtrip. Go check out the brand spankin’ new trailhead at Taylor Mountain Forest! 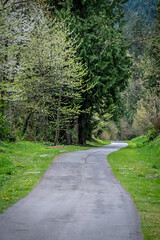 Taylor Mountain Forest is located in the Issaquah Alps, south of I-90 and east of SR-18, between the communities of Hobart and North Bend in eastern King County. This working forest is intended to demonstrate environmentally sound forest management, protect and restore ecological systems and provide passive recreational opportunities. Thanks to a NOVA grant from the Washington State Recreation and Conservation Office, 2 miles of trails (the Elk Ridge and Carey Creek Trails) have been improved to accommodate equestrian usage. Go check it out!